SIFF Turf and Facilities Head of Department, Reuben Oimae, said that the objective is to ensure that Lawson Tama is at its best for the opening match of the new O-League season. “Lawson Tama has not been in heavy use this year compared to the last so the turf quality is good but we still need to make sure that all is set for this important match,” Oimae said. The Honiara Football Association (HFA) Top 10 Championship has had to be postponed for Lawson Tama’s O-League rehabilitation. An understanding has been struck with HFA, the main user of Lawson Tama, for their Top 10 matches to resume straight after the Koloale v. Lautoka match this weekend. The final Top 10 match was played Wednesday the previous week so all HFA clubs participating in the championship are taking a break and training for the resumption next week. Meanwhile the Lawson Tama turf team is continuing with their preparation work. General cleaning up of Lawson Tama is in full swing with the place expected to be ready ahead of schedule. Another team is also working on repairing the grandstand rooftop. So far they have removed all the old roofing iron and are now working on removing old timber in the roofing structure for replacement. The construction team is confident that their work will be completed before Friday. Lawson Tama is the only playing facility in Solomon Islands qualified for hosting O-League matches. 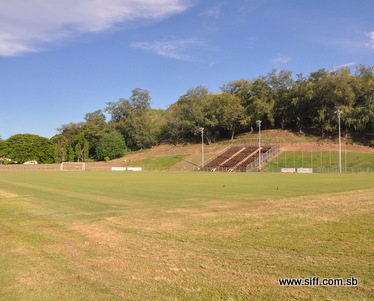 SIFF is hoping that eventually O-League matches will be brought to the provinces for the benefit of rural football fans.